Generous school friends of tragic Dylan Crossey have raised over £4,000 for the hospital which tried to save his life. Pupils at All Hallow’s Catholic High School in Penwortham, where Dylan was a year 11 student, raised the sum for the Royal Manchester Children’s Hospital by choir singing, non-uniform days, bucket collections and sales. “It’s overwhelming”, said Dylan’s mum Tracey Milligan. “I went in just thinking they’d been doing a fundraising non-uniform day, but the headmaster said they’d smashed their £4,000 target. 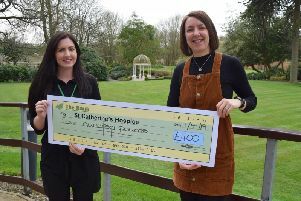 The money from All Hallow’s brings the total raised since Dylan’s death in October to more than £10,000. Over £5,000 was raised at a memorial football game to him played at Bamber Bridge’s Sir Tom Finney Stadium, and Cop Lane Primary School and Kingsfold Primary School have also held a number of fundraising events. The family is now planning on organising a ball to present cheques to their chosen charities - Manchester Children’s Hosptial, Rapid Response and Penwortham St Teresa’s Football Club, as well as setting up a charity in Dylan’s name. Dylan, of Buckshaw Village, died aged 15 on October 8 after being knocked off his bike the night before in Chain House Lane, Whitestake. A 42-year-old man from New Longton is on bail until February 27, having been arrested on suspicion of causing death by dangerous driving and drink driving.